Where'd This Emoji Movie Tweet Go? Images via screenshots/The Emoji Movie. 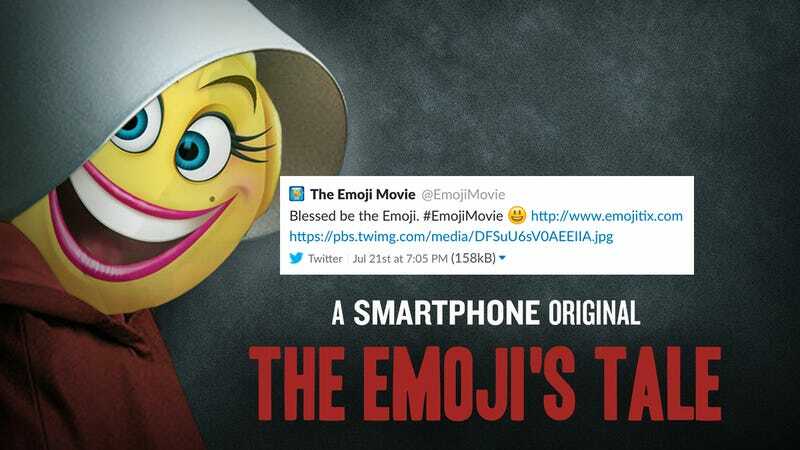 On Friday evening, The Emoji Movie’s Twitter account posted an image of one of the film’s many expressive characters dressed as a handmaid from the Hulu adaptation of Margaret Atwood’s dystopian novel The Handmaid’s Tale. Some three days later, the Tweet was deleted. Meanwhile, sources are telling me the social team behind The Emoji Movie has scrapped plans to replace all the women on the Glow poster with the poop emoji.